If you need some help choosing between SleepRight Nasal Breathe Aid and Rhinomed Mute, we are here to lend you a hand. Both brands of nasal dilators are quite successful in eliminating nasal obstructions that cause snoring, but they still differ in several important aspects. Our SleepRight VS Rhinomed Mute comparison can help you quickly discover what it is that sets them apart and what makes one of them a safer and wiser choice. SleepRight is a simple anti-snoring solution that boasts great flexibility, efficiency, and ease of use. This snoring aid consists of nasal flares that expand the nasal passages and allow air to flow freely, thus reducing the chance of snoring. Rhinomed Mute is one of the best, most flexible nasal dilators currently on the market. Namely, it can be adjusted to fit three different sizes, which makes it not only an effective snoring aid but a comfortable one as well. SleepRight Nasal Breathe Aid is reusable. A single dilator can be used up to 15 times. The dilators are sold in 3-packs, so you need to purchase a new box every 45 days. SleepRight Nasal Breathe Aid is made in an FDA inspected and registered facility in the USA. It is soft, flexible, free from latex, BPA, and drugs, and causes no skin blemishes. The exact material is not indicated. 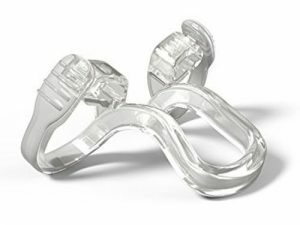 SleepRight Nasal Breathe Aid comes in only one size, which is somewhat unusual for a nasal dilator. It is highly customizable and allows you to curl each flare in order to achieve the optimal fit. The flares should be curled inward until they can rest comfortably inside your nostrils, without excess pressure. SleepRight Nasal Breathe Aid is a comfortable nasal dilator that you can get used to in just a few nights. The length of the adjustment period depends on whether you have used a similar device before, but it should not take longer than a week. SleepRight Nasal Breathe Aid can significantly reduce snoring, alleviate nasal congestion, and help snorers with deviated septums. It is comfortable, customizable, and flexible and it can work for all individuals whose snoring is caused by obstructions of nasal airflow, increasing airway volume by up to 58%. SleepRight Nasal Breathe Aid requires only basic maintenance – you should wash it after use. When washing, you can use cool water and mild soap, rinse the device thoroughly, and let it dry completely before storing. SleepRight Nasal Breathe Aid is sold through Amazon.com. For information on refunds, please see Amazon’s refund policy. SleepRight Nasal Breathe Aid does not come with a warranty. Rhinomed Mute nasal dilator is reusable. You can use a single dilator up to 10 times. The dilators come in 3-packs, so you need to buy a new box every month. Rhinomed Mute nasal dilator is made of ultra­soft, medical-grade polymers and it is anatomically designed for maximum comfort. It is FDA-approved, latex-free, and 100% recyclable. Unlike many other nasal dilators, Rhinomed Mute is customizable. It uses patented dilation technology that allows you to adjust the paddles from side to side until you achieve the perfect fit. It also comes in 3 different sizes: small, medium, and large. To discover the optimal size for you, you can purchase the trial pack that features 3 dilators, one in each size. Rhinomed Mute is relatively easy to get used to. It usually takes no more than a couple of days to get accustomed to the device and the length of the adjustment period depends on how quickly you discover which dilator size and paddle settings work best for you. Rhinomed Mute has been clinically tested. The results of clinical trials show that it successfully reduces the volume and severity of snoring in 75% of snorers who suffer from nasal airflow obstructions. Furthermore, the findings indicate that Rhinomed Mute is around 38% more effective than nasal strips. It allows for uninterrupted nasal airflow and reduces the pressure applied to the septum. Rhinomed Mute nasal dilator should be washed immediately after every use. You should wash it in warm water and mild soap, rinse it thoroughly, and dry it well. Once the device is dry, store it at room temperature, away from direct sunlight. When washing, make sure you do not damage the dilation mechanism. Rhinomed Mute nasal dilator has no known side effects. Rhinomed Mute nasal dilator is sold through Amazon.com. For information on refunds, please see Amazon’s refund policy. Rhinomed Mute nasal dilator does not come with a warranty. After patiently waiting over a month for this product to arrive, I am incredibly disappointed. I didn't get a Sleeprite device as advertised on the website. I received some wierd ripoff from China, a 2 in 1 Anti Snoring & Air Purifier model: MX-555 from a business called Shiming Xu??? There is nothing to indicate this is a genuine SleepRite product, in fact, it looks like a ripoff. All the packaging is different and air vents are blocked. This is garbage and does not work. I feel so stupid thinking this could actually help my boyfriend who snores night after night. The snoring has been so bad we have not been able to sleep in the same bed for a full year. This company is just a scam. The shipping was pretty fast and convenient and these little things simply work. They didn't quite eliminate my snoring, but they've cut it down significantly. This coming from a woman who had two septum surgeries and tried more nose sprays than she can count. Worked perfect for me. Will be giving up Breathe Right nasal strips. Breathe Right nasal strips do work, but they wreak havoc on the skin of my nose. I switched to this breathe aid because my skin was getting red and itchy from nasal strips. This product doesn’t cause that, but it does cause some initial discomfort you eventually get used to. Better than strips but not ideal. It's a pretty interesting concept and I was really looking forward to trying it. However, the large size doesn't fit my nose and I can't get enough air wearing medium. Rhinomed is adjustable to an extent, but obviously not enough for me since I constantly struggled to breathe when I go to sleep and when I wake up. Interesting product but the sizes don't work for me. This is the first product that did anything to reduce my snoring and feels comfortable when I wear it for many hours. I first bought a variety pack to identified the perfect size for me and then I ordered a box of those. I'm very satisfied so far and will update this review on might six-month mark. This stuff really works. I didn’t like it at first because I had a hard time adjusting it to my nose, but after several nights I figured it out finally. You just have to be persistent about it. Excellent product in my book. Not too expensive, very light and discreet. Rhinomed Mute Nasal Dilator provides additional "structure" to your nostrils, allowing for uninterrupted airflow, which results in normal breathing. Gather all the relevant information in our honest Rhinomed Mute Nasal Dilator review.